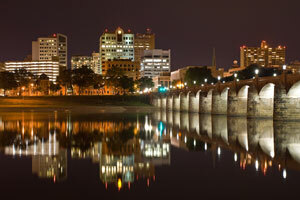 Harrisburg is home to nearly 50,000 people and is the capital city of the state of Pennsylvania. There are advertising opportunities all over the city allow you to effectively spend your advertising budget. Utilize out-of-home advertisements in downtown Harrisburg near high traffic venues such as the Whitaker Center for Science and the Arts. Target your audience with outdoor billboards or other outdoor advertisements near colleges like the University of Pennsylvania or Dickinson College. The major highways and roadways servicing Harrisburg also provide billboard possibilities. Billboards on I-83 especially would generate high traffic exposure of your business. Zip Codes: 17101, 17102, 17103, 17104, 17105, 17106, 17107, 17108, 17109, 17110, 17111, 17112, 17113, 17120, 17121, 17122, 17123, 17124, 17125, 17126, 17127, 17128, 17129, 17130, 17140, 17177.